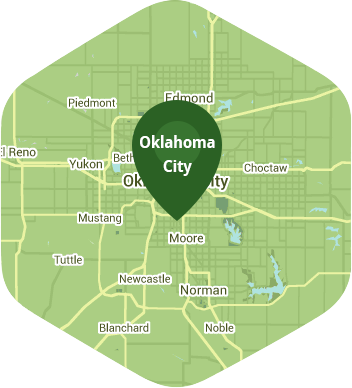 Book a skilled lawn pro in Guthrie. Backed by a total satisfaction guarantee and amazing customer support. Guthrie may be a part of Oklahoma City, but it manages to retain a small-town feel with picturesque buildings and shops that remind its residents of times gone by. The wide open and sweeping plains surrounding Guthrie are a constant reminder of the beauty of the land, a beauty not lost on you. If you enjoy lush landscapes and wonder how you can incorporate that feel into your lawn, then you need to learn about Lawn Love. Lawn Love is a fully insured and bonded lawn care company. Our experienced and focused team of lawn care technicians can help you to create a picturesque lawn for a picturesque place. When you let Lawn Love take care of all your lawn care and maintenance, you won't have to do any of the weeding, seeding, planting or mowing ever again. And your free time becomes just that – free time for you to do what you want when you want it. To get started, simply call Lawn Love today at 405-926-8318 and take advantage of our free, fast and easy two-minute quote! Rated 4.75 / 5 stars in 3,719 Guthrie customer reviews. There won't be any rain in Guthrie today, which means you'll probably have to water your lawn. Dusk and dawn are the best times to water your lawn (the sun will rise at 6:47 AM and set at 8:09 PM today in Guthrie). Here are some average lawn care prices for homes in Guthrie. Average lawn size 7,932 sq. ft.